WISK-IT APP HOME PAGE: WISK-IT is the innovative new app that helps you clean up your "dirty laundry" on facebookLet’s face it, every image of you on Facebook isn’t perfect. Maybe it’s a lingering Spring Break photo that you’d NEVER want an employer, significant other, or your mom to see. Or the one from the glory days of high school that you’d rather forget. Or perhaps it’s one of those “fat photos” taken at just the wrong angle in just the wrong light that makes you look less flattering then you truly are. With over 10 billion photos on Facebook— and the awesome ability to share like never before— everyone’s got a photo that needs to be washed away. That’s where WISK-IT comes in, from the makers of WISK Laundry Detergent. Conceived and developed by TracyLocke an integrated marketing agency, the Wisk-It application allows users to search tagged, untagged, and detagged photos in their friends’ Facebook albums and provides a direct and efficient way to request they’re removed for good. In other words, your online profile gets cleaned up, just like your laundry. Which is a pretty innovative way for a laundry brand to tackle the digital space. WISK-IT REQUEST PAGE: Send your friends a personal request to wash away an image that might stain your reputation. Here’s what Phil Koutsis, Executive Creative Director at TracyLocke had to say about the Wisk-It app: “We were looking for a natural way to extend the Wisk brand into the world of facebook. Wisk provides such a powerful clean we thought maybe it shouldn’t stop at the laundry room. What if we could also clean up people’s “dirty laundry” online?” Ian Wishingrad, one of the young creatives at TracyLocke that lives on facebook and helped conceive WISK-IT added, "there simply wasn't an efficient way to find and remove all those photos that you know aren't helping your reputation. Especially if you're right out of college and trying to find a job." The new Wisk-It app is easy, and it’s fun. Once installed, the app pulls your photos so you can simply click on the one you want to wash away. You can even send a personal message along with the photo to your friend. After you’ve sent your request, it hits the status tab as “dirty”, “in the wash” or “clean” so you can keep track of things. 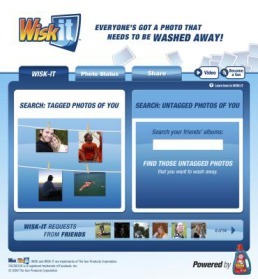 WISK-IT Status tab: It's easy to keep track of those photos that you've requested be removed. They're either Dirty, In the wash, or clean! So go ahead, whether your request is light-hearted or serious, you’re searching for a job or trying to keep one, or have a Halloween photo that’s sure to haunt you— it’s time to Wisk-it. Click to go to the Wisk-it app! Just download the app. Great idea and really smart way to connect this Wisk brand with an online audience. And as far as my images go, I already found an image from Halloween that's got to go. Way to go Wisk-it.